The Korean government on Tuesday said it has shut down 12 illegal websites related to cartoons and other media content, and announced plans to continue its watch over such activities for the next two to three years. The pangovernmental task force announced the results of a crackdown that commenced in May, and which monitored foreign-based illegal websites that allowed users to share content without regard of the copyrights. 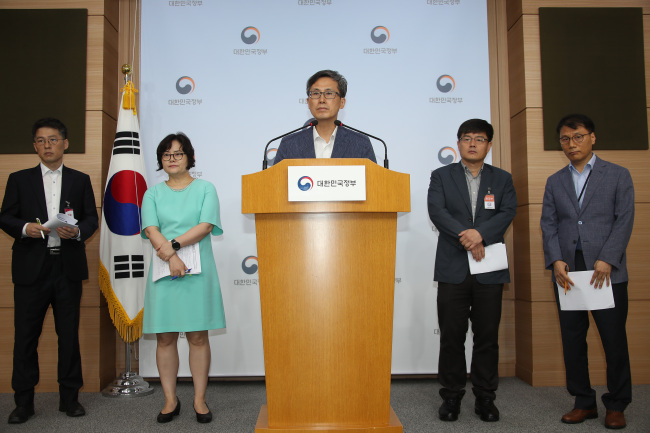 Officials from the Ministry of Culture, Sports and Tourism, the Korea Communications Commission and the National Police Agency formed the government team. Operators of eight websites, including webtoon-sharing site Bamtokki, or Night Rabbit, and Jangsisi will be prosecuted. There have been numerous cases where illegal websites, torrent sites and internet video streaming sites have operated with servers based outside Korea, making it more difficult for authorities to crack down on such activities, as they lie outside the local police jurisdiction. “These measures send a clear warning that foreign-based illegal websites are no longer in the blind spot (of the authorities) in regards to copyright infringement. We expect to prevent further infringement in the future,” said Moon Young-ho, director general of the copyrights bureau at the Culture Ministry. Copyright infringement has been ailing the local content market, particularly the ever-growing webtoon market. The Graphic Novel Industry White Paper from the Korea Content Agency puts the local comic book market at around 976 billion won ($875 million), and the webtoon market is estimated to be around 724 billion won annually. In May, local media reported that the webtoon industry estimates the black market for webtoons in Korea to have caused around 240 billion won worth of damage to the market, though specific numbers have not been released by authorities. Last year’s report from the Korea Copyrights Protection Agency said that 38,541 cases of copyright infringements of cartoons online had occurred from January to October. That represents more than a quadruple increase from the year before, which numbered 8,176. Responding to the situation, Lezhin Entertainment -- the operator for Lezhin Comics -- launched a response team to sniff out copyright infringement of its products last year. The authorities noted that a parade of alternate sharing websites popping up had ultimately diminished the effect of the initial shutdowns by the government. This came in the form of adult01.com -- also eventually shut down -- being created upon the aforementioned websites being shut down. A figure provided by the Korea Copyrights Protection Agency showed that the number of people using these illegal websites dropped drastically after the shutdown, but recovered within days as alternate sites were created. The figure dropped again upon the operators being arrested. “In order for there to be a substantial effect, we need to consistently crack down for the next two to three years with cooperation from related agencies. ... We also plan to launch a nationwide campaign (against illegal content sharing) within the second half of this year,” said Moon of the Culture Ministry. The KCPA and KCC agreed to increase the personnel on the watch for illegal websites. A revision of the copyrights law that would allow a swifter response by authorities is pending at the National Assembly. When online copyright infringement is reported to the police, the current law stipulates that it must be deliberated on by the KCPA, then the KCC before the Culture Ministry can order appropriate measures. The revision would allow the procedure to bypass the KCC deliberation, which is expected to significantly shorten the process, which currently takes about two months.